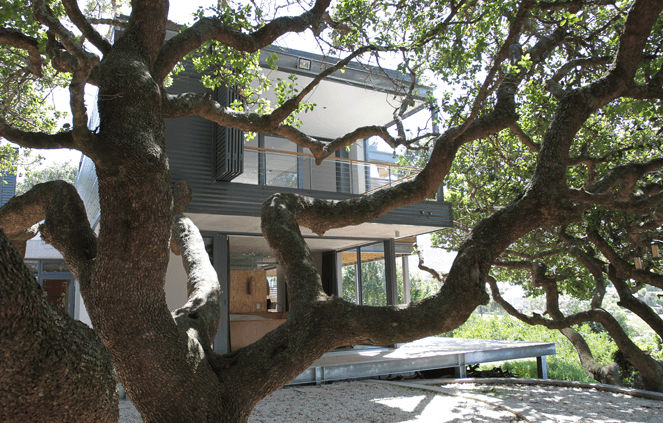 This weekend house on bank of the Onrus River lagoon is situated within a grove of protected White Milkwood trees, the largest of which are estimated to be over four hundred years old. The house is conceived as a caterpillar-like structure that weaves its way between the Milkwoods, camouflaged by its darkly clad outer skin. A double storey pavilion was placed in the clearing on the Northeastern side of the site, like a bird hide, facing the mountains and the river. The bedrooms were tucked away on the lower level surrounded by the trees. Floating timber balconies wrap around on both levels to generate a seamless interface with the landscape. Internally, the house has a warm materiality mimicking the colours of the reed river landscape. The architecture aims to heighten the experience and awareness of nature by a careful unveiling of the landscape through a sequence of differentiated spaces that terminate in large picture windows. The picture windows can be opened entirely by sliding the large doors into the wall cavities; this dissolves the boundaries between interior and exterior and immerses the viewer in nature. Project Team: Bettina Woodward, Marine Leblond & Kurvin Virahsawmy.